Afternoon in time transfer to airport to connect flight to Bhubaneswar. Bhubaneswar is the temple city of the east. The ancient city of Bhubaneswar (Bhuban being world and Ishwar God) is a walk down centuries of temple architecture. It is probably the only city in the world that enables an authentic over-view of the stages of development of Hindu religious architecture. In the fast moving world of today these temples are a gentle reminder of the splendor, the heritage that was once India. Regular dances by the ’Devadasis’ or divine servant girls, rituals and rites, recital of hymns were all an integral part of temple culture. Temples in Bhubaneswar are built on a common plan as prescribed by Hindu norms. All visible parts of a temple are sculpted with motifs of priests, kings, courtiers, pilgrims, celestial dancers, couples in embrace, birds, animals or scenes from religious epics and legends. Breakfast at hotel. Afterwards embark upon your days trip to Joranda. Joranda: headquarter the of Mahima cult; visit their monasteries & the monks who are wearing the barks of the trees. Return to the hotel in the evening. Stay overnight at the hotel. Breakfast at hotel. Afterwards you visit to Jain Caves in Bhubaneswar and after finishing the sightseeing of the caves drive to Puri. Early Jain cave temples are located on the twin hills of Udayagiri and Khandagiri, constructed during the Chedi dynasty (2d century BC - 1st century AD), the caves are famous for some fabulous art work. On arrival in Puri check in to the hotel. Rest of the day free at leisure. Puri is famous for its Historic antiquities, Religious sanctuaries, Architectural Grandeur, Sea-scape beauty, moderate climate. 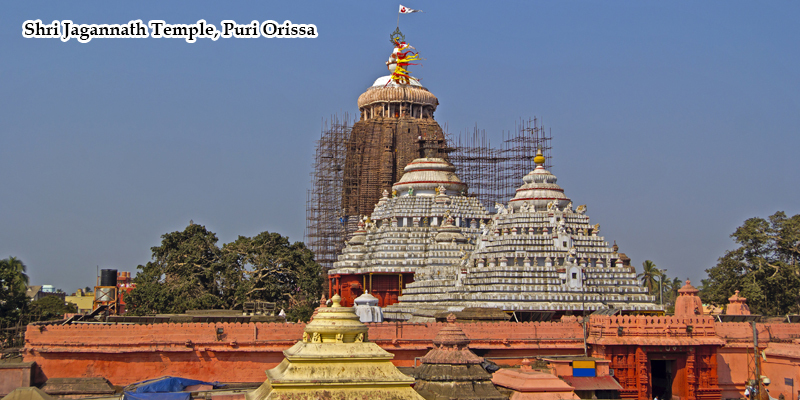 Jagannath temple is world famous temple in Puri. Overnight will be in Puri. Breakfast at Hotel. Afterwards you embark on the sightseeing trip which would include your visit to- Konark sun-temple, & the Jagannath temple. Puri is one the famous religious cities in India having the famous Jagannath temple , The sunny beach at Puri is one of the finest in the world. Watching the sunrise in a symphony of colors is a wonderful experience. Rest of the day free at leisure. Overnight at Hotel. After breakfast this morning drive to Gopalpur Via Chilka Lake. One of the most pristine beaches of Orissa, Gopalpur beach is a marvelous retreat for sea-worshippers. Chilka lake is divided into an outer channel with a narrow neck leading into the sea and the main body of the lake with a muddy bottom rich in organic matter. On arrival at Gopalpur check in to the hotel. Overnight will be in Gopalpur. Breakfast at hotel. Afterwards drive to Rayagada. Rayagada, the headquarters town of the district of same name, is on the way to Koraput from Berhampur. It has the facilities to serve as a base for visiting the nearby places of interest. On arrival check in to the hotel. Rest of the evening free at leisure. Overnight will be in Rayagada. Breakfast at hotel. Afterwards visit Chhatikona Dongariya Kondh market. Later drive to Jeypore. Jeypore, the commercial hub of Koraput district is gifted with waterfalls and forests and is teeming with colorful wildlife. Breakfast at hotel. Afterwards drive to Onkudelli, the interesting markets of Bonda, Gadaba and Didayee market. Later visit Ollar Gadaba village on the way back to the hotel. Onkudelli and Didayee are the famous tribal markets. These are very famous for hand made objects. Afternoon at leisure. Overnight at Jeypore. Drive to Vishakaptnam enroute visit Kunduli Paraja Tribal market (only on Friday) & some beautiful Indian villages and caves. On arrival transfer to hotel. Rest of the evening free at leisure. Overnight at Hotel. Start with a stop at the Gateway of India- a Indo – Sarcenic style of architecture (1927), designed by George Wittet to commemorate the visit of George V and Queen Mary in 1911, drive, past the Victoria Terminus the most remarkable example of Victorian Gothic architecture in India opened during Queen Victoria’s Golden Jubilee Year, Marine Drive and visit the Hanging Gardens so named since they are located on top of a series of tanks that supply water to Bombay. Visit the Jain Temple built of marble and dedicated to the first Jain Tirthankara. Much of the decoration depicts the lives of the Tirthankaras. And last but not the least, make a brief photostop at “Dhobi Ghat” the Indian laundry system & the Mani Bhawan.